Paloma Beach is an attractive development of 230 self catering holiday apartments located in Los Cristianos on the south coast of Tenerife. Built around a large pool area, private gardens and sun terrace Paloma Beach offers guests a tranquil haven for sun. Please avoid these apartments. The furniture is old and the settee was unacceptable. The springs had collapsed and a not very clean yellow cover had been thrown over it. The television was a 15" screen and must have been 20 years old. We complained and shown another which was no better. We have stayed at Paloma Beach 5 times now and find the apartments clean and well furnished. The pool is the cleanest we have ever been in but not suitable for young children as you can not have any inflatables in the pool but saying that it suited us very well as we are a couple in our early 50s and all we wanted to do was veg out and relax and Paloma Beach is exactly what we wanted. The younger members of staff were very helpful and yes you have to pay 2 euros for a sunbed and 2 euros for an umbrella but you would have to pay that on the beach. The supermarkets are well equipped and no matter what people tell you Iceland is not the cheapest! Captain John will book any trips you want, he talks a lot but lovely man. We will be back later in the year. Self catering apartments which are privately owned and very good. Disappointed when toddlers playing in the children's area of the pool were told to remove their buckets and plastic watering can from the pool and were not allowed to use plastic flotation rings (the ones they can sit in). A bit boring for children as a result. Staff not the friendliest either. Felt accommodation was quite pricey once we actually saw it. Self catering here means you also have to supply your own toilet roll which was a first for us. No specific complaints but found the place to be only average and staff not very helpful. Quite a walk into Los Cristianos and we had two small children. Would not stay here again. I always use this web site to research a holiday and so far it has stood me in good stead. Our holiday was booked a month before we came out and overall it was very good value for money. As these are private apartments it is the luck of the draw as to the decor and standard of interior of your allocated accomodation. Ours was pretty good although a few of the tiles were either cracked or loose and you made a note where you were standing in bare feet etc. The comments on toliet rolls are true you did provide your own but it was available in the nearby Iceland and hey its not the end of the world. 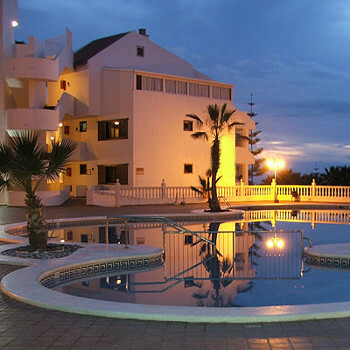 Stayed at Paloma Beach apartments in Los Cristianos, Tenerife. We found the apartment which is privately owned to be clean and very convenient being situated directly next to the bar. The towels were changed twice during the week and the bed linen once. One of the bedrooms in the apartment (ours) had no window just a grill to the corridor. There was no fan in the room and I think in the middle of the summer this could be a problem although it wasn't for us as we were there in February. The cooking equpment was rather sparse but as eating out was so cheap it didn't matter. I would recommend these apartments as they are very conveniently situated. just back from paloma beach appartments. very dissapointed. washing machine out of order, toaster out of order, no remote for t.v,no clean towels,reception staff very unhelpful they wanted 130euro for use of appartment for few hours on our last day,restaurant very good staff in restaurant very helpful,would not reccomend palma beach to anyone. No complaints about Paloma Beach Apartments other than guests not adhereing to noise level after a certain time at night. Anything that was missing from the apartment regarding selfcatering was quickly replaced. Linen was changed once a week, & towels twice weekly. No complaints whatsoever. The staff were ever so helpful, and the location was great. 2 Supermarkets on the doorstep, Iceland & a Spanish supermarket which by the way will deliver your groceries if needed. I will be back to Tenerife, but will probably choose another month as January was very breezy!! My wife and i visited for the first time last july, 2007. The apartment was very well maintained and decorated very nicely. It had all the utensils you would find in a kitchen at home. The oven was new and very clean as was the fridge freezer. I was suprised to read about the previous comments about the staff on reception, i found them to be very friendly and helpfull. The pool is very well maintained and the surrounding gardens are a nice touch. The bar is quite handy by the pool and has kareoke in the evenings, not quite my thing but it appeals to some. There is a shop literally two minutes walk from the apartment, which is like a small tesco's. It sells all types of food and grocery items as well as alcohol. At the back of the shop there is a bakery which sells freshly baked bread. There is also a cash machine outside the shop. This is the first time in the Paloma beach apartments found them to be extremely spacious and clean. We had a penthouse which had all you need for a great holiday, the kitchen was great all the comforts of home, it had cooker oven microwave full sized fridge freezer great for the ice creams. The linen was changed every 2 or 3 days depending on weekends. There is a club on site which has good food and some entertainment,there is no noise after midnight because the entertainment stops then.